The B.C. College of Teachers is now history, and a new teacher regulation branch of government opened its doors Monday. Find its website here. The branch has issued a call for nominations of teachers from five regions to serve as members of a new 15-member B.C. Teachers’ Council. In addition to five elected members, the council will have three members appointed by the BCTF and seven selected by partner groups (trustees, superintendents, principals, parents, education deans, independent schools and first nations). The deadline for teacher nominations is Feb. 1, 2012. Get details here. The council will set standards for teachers. Nine of its members will also handle discipline issues, under the direction of a commissioner appointed by cabinet. That has yet to happen. Staff from the former college have transferred to the ministry and will continue to process complaints and certify teachers, says a story in the Victoria Times Colonist. UBC Library is offering Valentine’s Day card sets for sale – now available at $5 per set (including tax). 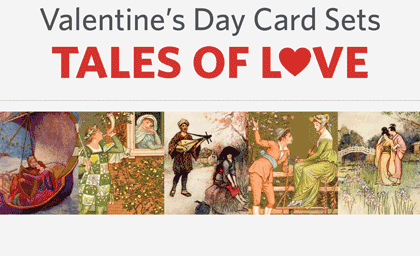 With images from myths, fairy tales and stories of eternal love, these cards will be a hit with your sweetheart. Images are taken from UBC Library’s Rare Books and Special Collections (RBSC), and each purchase supports UBC Library. Each set contains five blank cards, with envelopes. To purchase the sets in person, visit circulation desks at the Irving K. Barber Learning Centre and Koerner Library. Curious about the amorous occasion? Find out more about Valentine’s Day from History.com. And stay tuned for details about a Valentine-related exhibition at RBSC in February!